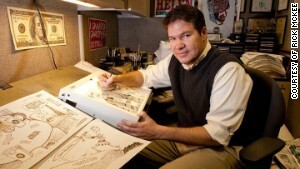 From doodling pictures of the principal in his high school English class to skewering the president of the United States in the newspaper pages of America, Rick McKee has been cartooning all of his life in one form or another, and has been entertaining readers of The Augusta Chronicle since January 1998. McKee is one of the most reprinted cartoonists in America with his cartoons syndicated to more than 850 newspapers across the country and around the world by CagleCartoons.com. In 2013, McKee won first place in the international Ranan Lurie/U.N. cartoon competition. In addition to appearing in most major newspapers, McKee's award-winning work has been featured on CNN/Headline News, the Fox News Channel and in Newsweek. United Sketches, an international organization to support freedom of expression and cartoonists in exile. A collection of his cartoons, "Painting With a Broad Brush"
was published in December 2015.